Today's Draw: Eight of Swords from the Phantasmagoric Theater Tarot in the What's Crossing Positive Influences in My Life position from the Deck of 1000 Spreads. Have not been able to manifest what you want in life? Is it possible you've given up too soon? Or could it be that you just tried too hard? 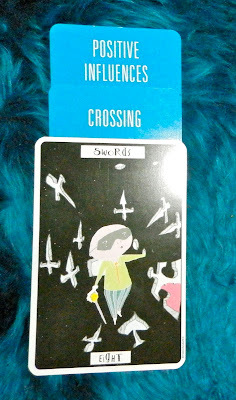 A "crossing" card is usually a card that is placed on top of another card in a tarot spread, crossing it, like a plus sign. (This is different from a "covering" card, which is placed square on top of another card in a spread, thereby covering it.) The crossing card can either help or hinder the card it crosses, depending on the context (whereas a covering card is always hindering or getting in the way of the card beneath). In this case, the crossing card is what's getting in the way of positive influences in our lives. And the Eight of Swords from the Phantasmagoric Theater is about not making decisions, having a lack of patience or giving up too soon. So consider if leaving things up in the air or backing out too soon might be blocking the positive influences in your life. One of my friends calls me "lucky like a fox", because I set myself up for success without even trying. It's not like I stumble into luck or luck just happens to me. At some level it's by design, but I'm usually not conscious of it or "trying". Here's an example. When I first joined Facebook, I decided to friend some tarot people, because it's my hobby. At this point, I had no intention of ever writing a tarot book or creating a product or anything like that. In fact, it was the furthest thing from my mind. I did know I wanted to one day write a spiritual book one day, though. But I certainly didn't think anything on Facebook would help that. So anyway, while chatting with the tarot people I friended on Facebook, I noticed a really friendly woman named Barbara that everyone seemed to know. She and I got along really well, so I friended her. A couple of months after friending her, I realized that the Barbara I friended was a big-time tarot author. And I thought, "oh cool I have a famous friend". Then, after time, I learned she was also mucky muck at Llewellyn, the big publisher in the space. But what did I care? I wasn't ever going to write a book. I was just happy that my friend that I liked was part of the tarot glitterati...haha. Then a year or more passes and I get the idea for the Deck of 1000 Spreads and I need to know how to approach a publisher. So I ask my friend Barbara, figuring I'd send the proposal to her and a few others. Then, as it turned out, my friend liked my idea and Llewellyn made me an offer. Lucky like a fox. Since then I've learned what it takes to get a spiritual book published. It's one of those Catch-22 situations. They want to know you're worth taking a risk on. So having a published work that's doing well in its space doesn't hurt. Having a following on my blog (that I started for no conscionable reason other than I felt drawn to do it) and having this now huge cache of content and spiritual thought, also doesn't hurt. Nor does the discipline it takes to do this every day. Nor does the fact that I have a loyal following. None of this was planned to fall into place like this. But the end result of writing a spiritual book was. Now, that part hasn't manifested yet, but after attending a seminar on publishing spiritual books not that long ago, I learned that I'm WAY better positioned than most others. I've somehow already done all the work that looks like such a huge obstacle for them to traverse. Lucky like a fox. Now, the reason I've told you all of this is because I think a lot of people set an intention, sprinkle some seeds, then sit and watch. And wait. And poke the ground. And stay on course. And spend their energy completely on point. Then get disappointed when nothing bears fruit....or when it bears little fruit. "Lucky like a fox" plants seeds and goes on with their life, sprinkling seeds everywhere they go. And they get caught up in the wind like a leaf, floating here and there, doing loop-de-loops and never quite landing. Never having any concrete expectations from the seeds they plant, never making a specific planting with the intention of it growing. Just knowing their ultimate intention, then going on with their lives. In Buddhism, it's called detachment...detaching from the outcome. When you go after something pointedly with intention, the temptation to manipulate outcomes is huge. And this sort of desperate energy is felt all around. It's constricting. It narrows the flow of positive influences, because your definition of what is "positive" is something entirely dependent on its ability to bring an outcome. So maybe you make connections with people solely for the purpose of reaching your intention. And that is felt. Or maybe you don't "waste time" on writing a tarot book when what you really want to do is write spirituality books. So you don't get a good track record with a publisher, or a following from people who like your work, because you didn't anticipate you'd need all that. When you detach from an outcome and just float in the wind like the leaf...always moving forward but not attached to any single action producing an outcome...you float in a field of greater possibilities where pathways offer themselves to you through weird little whispers in your ear—"friend that chick Barbara", "write a tarot book", "start a blog". And you follow these voices and some bear fruit and some don't. And you may plant 1000 seeds, but you're not keeping count, because you're not outcome driven. Your intention, like everything else along the path, is a seed you've planted in the universe. And as long as you keep moving forward, you trust it's getting water and sun and food. And because you're not so constricted by having to watch the earth, positive influences have a much greater pipeline through which to reach you. So that's what I think today's Eight of Swords is trying to say. The little guy has a turkey baster with which he's conceived his idea. But he's otherwise trapped in the dark, not knowing where to move...instead of just moving anyway. He's waiting for a red carpet to roll out and guide him through all the thoughts (swords) in his head. And he's even giving some of those ideas "the hand". He's thinking too hard...trying too hard...and making it all too hard. Some of those ideas he's refusing might be positive influences in disguise...or routes to positive influences. But he's not free wheeling and open enough to even consider that. People who have what you want didn't get there because they never failed, made a wrong turn or tried something that led to nowhere. They got there because they kept on moving forward despite all of that. And they probably kept on failing, too. But they were on a journey, not running errands, you know? And they probably found success in a way they never could have imagined or set up through conscious thought. They were lucky, yes. But they set the luck up for themselves through the seeds they planted, the perseverance they had and the wide channel they created to allow positive influences to flow in through. Lucky like a fox. This post rang really true for me. I have a friend who's been feeling he's at a standstill career-wise for a couple of years. I keep suggesting he blog, as he writes really well. He said, "What's the point, it doesn't make money?" While that's true at a direct level, it's like your Facebook seeds, with lots of potential! Oh, that's so true! As long as your friend takes that stance, opportunities are passing him by. I used to host monthly "classes" at my house for friends. There was no money in it. In fact, I served refreshments, so it cost me money...haha. I didn't know why I was doing it other than it felt right. And those classes gave me the confidence to teach tarot and psychic arts for money. That also gave me the confidence to read professionally for a while. And the "authority" those things gave me, gave me the courage to approach a publisher. All of that started by trying something out for free. You never know where things will lead.